The setup of the portfolio is split into two parts. Wait… got lots of images? Upload many images at once using the Portfolio Bulk Uploader, see this page. You should first decide if you want to use the sortable portfolio filter to allow users to filter the portfolio items by any category you create. 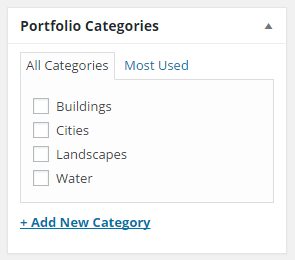 If you want to use this you should first add the categories to save you having to edit each portfolio item again to assign it to a category, although these can be changed at any time. To add a portfolio category, go to Portfolio → Categories on the WordPress menu and add any categories to suit. Next, you can start adding portfolio items. Go to Portfolio → Add New on the WordPress menu, give your item a title and content if necessary. The image that will be displayed for this portfolio item is the Featured Image of the post. To add a featured image, click Set featured image on the bottom right hand side of the page. We recommend that uploaded portfolio images are at least 1024px wide, so that the images will fit neatly into most column layouts and on devices. React will not scale up images, so the larger the original image the better it will look when fit into the theme. If the original image is larger than 1920px x 1080px we recommend scaling it down to this size before uploading. Choose an image file from your computer and once it has uploaded, click Set featured image at the bottom. If you look below the post content area, you will find the Portfolio Options metabox. Here you can set various options for the portfolio item. The first option Type determines what will happen when a user clicks on the item in your portfolio. Once you’ve set up the options, assign the portfolio item to a category by using the checkboxes at the Portfolio Categories box on the right hand side. Create a page for your portfolio. Now you should add a portfolio shortcode to the page content, above the content editor click the Add/Edit Portfolio button. Decide on the settings for your portfolio then click Insert & Close to insert the shortcode. Save the page and you should now have a portfolio page. See also the Portfolio shortcode section for a detailed description of the options.